Richard C. Morais’ novel The Hundred-Foot Journey is dominated by three personalities. The first is “Papa,” the bull-headed patriarch of the Haji family who flee religious violence in Mumbai to open an Indian restaurant in the quaint French village of Lumière. The second is Madame Gertrude Mallory, the frigid, tyrannical owner and head chef of Le Saule Pleureur, the Michelin-rated hotel across the street from the Haji family’s restaurant who evolves from their greatest enemy to the steadfast mentor of their son Hassan. The third is culinary mogul Paul Verdun, a boisterous chef with three Michelin stars who becomes Hassan’s greatest friend once he leaves to make a name for himself in the kitchens of Paris. In Lasse Hallström’s film adaptation, these characters are, respectively, changed, downplayed, and outright removed. During the transition from page to screen, such alterations are of course to be expected. But I mention them to highlight the film’s central failing: it sacrifices the book’s identity in favor of more palatable characters, a more generic storyline, and a much more predictable conclusion. Morais’ novel is a sweeping examination of the life and times of Hassan Haji from childhood to middle age. It follows his heartbreaks, failures, triumphs, and confusions as he struggles to acclimate himself to a difficult life. Hallström’s film pauses in Mumbai for about three minutes before racing off to Lumière whereas the book takes sixty pages to get there. Hallström’s Hassan (Manish Dayal) is predestined for culinary greatness and practically everything besides his romance with Madame Mallory’s sous chef Marguerite (Charlotte Le Bon) is shown to be a stepping-stone for his ambitions. Morais’ Bildungsroman is simplified to a traditional underdog story that seems more fitting for a sports film. 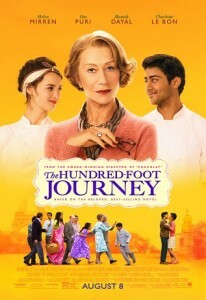 The most exciting moments of the film involve the Hassan family’s struggle with Madame Mallory, played by Helen Mirren in a performance that seeks to evoke Meryl Streep’s Miranda Priestly. Her machinations with the town’s politicians to shut down the Hassan restaurant are clever and border on the farcical (she considers a scheme to have the city raise the public walls around their restaurant so high that it will be invisible from the road). And despite her relegation to a mere supporting character, Hallström miraculously manages to give her role enough room to breathe that her eventual change of heart seems natural and unforced. One scene invented for the film where Hassan and Mallory cook an omelet together is especially masterful. Le Bon is suitably coquettish as the French object of Hassan’s affections. But her sudden hostility when he joins Mallory’s staff is cringe-inducing. The film plays it off as a natural reaction to the introduction of a culinary rival, but we as the audience identify it for what it truly is: the impetus for that most tired and unoriginal cliché of romantic cinema, the third-act break-up. The most remarkable aspect of the film is Linus Sandgren’s cinematography, which infuses the Alpine countryside with shimmering curtains of light that make the mountains seem bright even at night. The attention given to breathing life into the European settings reminds me of an earlier period of American cinema when Hollywood films weren’t afraid to set entire films overseas with nary a mention of the United States. Films were a form of travel, and The Hundred-Foot Journey seems eager to continue that tradition. Here is a film of exotic food, sun-kissed locales, and conflicting cultures. But there is too much salt and not enough meat to the story. It might be pretty to look at and pleasing to the taste, but all hints of the novel’s subtle flavors have been nuked in a microwave.